GEORGETOWN, May 14 2014 (IPS) - Agriculture has always played an important role in the socioeconomic development of Guyana, one of just two Caribbean Community (CARICOM) member states that straddle South America. Agriculture accounts for more than 20 percent of the country’s Gross Domestic Product (GDP). It is food-secure, and agricultural commodities represent more than 40 percent of its export portfolio. The 15-member regional bloc has always looked to Guyana, with an estimated 3.3 million hectares of agricultural land, as having a vital role in the Caribbean’s thrust towards food security. But the chief executive officer of the National Agricultural Research and Extension Institute (NAREI), Dr. Oudho Homenauth, warns that climate change is robbing Guyana of some of its prime agricultural land. 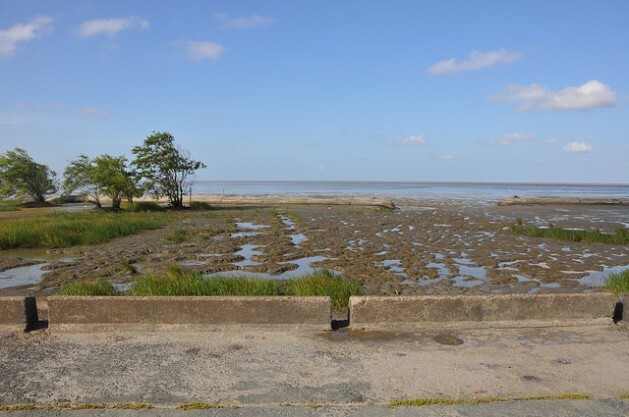 “We are seeing increasing rainfall, higher tides and so forth,” he told IPS, noting that this has consequences for farmland, particularly along the coast. Homenauth explained that “the land will have to be left for over a period of time until that salinity is lost” and as the authorities move to protect the agricultural land and also its population, most of whom live along the coasts, Homenauth told IPS that Guyana has come to recognise the importance of mangroves, especially for coastal areas. He said the country has been on an intensive campaign to protect and restore its coastal mangroves. Approximately 90 percent of Guyana’s population lives on a narrow coastline strip a half to one metre below sea level. That coastal belt is protected by seawall barriers that have existed since the Dutch occupation of the country. In recent times, however, severe storms have toppled these defences, resulting in significant flooding, a danger scientists predict may become more frequent. 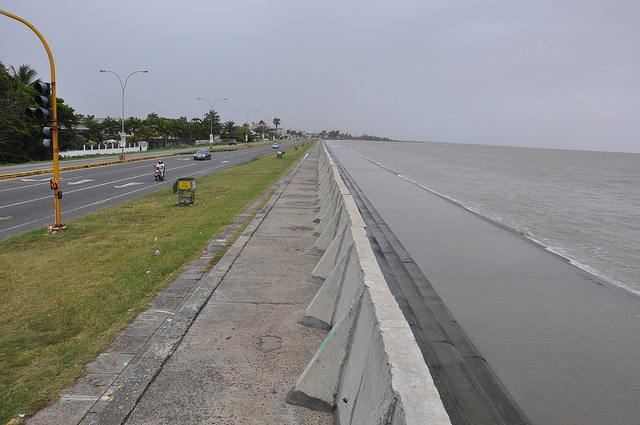 “Everybody knows Guyana’s seawall, the famous seawall, which is an expensive structure to maintain and to continue to build, particularly as sea level rises,” Agriculture Minister Dr. Leslie Ramsammy told IPS. Guyana has about 80,000 hectares of mangroves in place right now and over the last three or four years, the country has been “accelerating the growth of mangroves”, many of which were lost 20 to 30 years ago. As a result, Guyana has been conducting research to determine the best technology to use to achieve success. “You need mangroves to grow to a certain extent before it can withstand the water and so we’ve been trying things like various grasses and so on to hold the soil together and we have been succeeding in these,” Ramsammy told IPS. Technicians came up with the idea of constructing geotextile tubes to help natural regeneration. A biodegradable tube filled with sand and water is used to form a barrier so that at high tide, muddy water can enter the area and sediment left behind can help build the soil up to a necessary level. Spartina grass is then planted in the area. The technicians have found that the mangrove seeds would get caught in the grass and would later germinate. When it comes to climate change and global warming, Ramsammy believes Guyanese should take pride that they are perhaps the most aware country in the world. “I can’t say that our people know all the details, all the science, but that’s not the point. If we could also make them aware of the science that’s okay but they are very aware of climate change as a phenomenon; they are very aware of what climate change can do to us and therefore they are becoming part of the climate change revolution,” he told IPS. Ramsammy noted that no country is too small to do something about climate change. In fact, he said there are things that every citizen in the world can do. “I’ve heard people say ‘I’m poor and I’m not a scientist and I can’t do anything.’ In fact we can do much as small countries, including in the reduction of emissions,” he said. “We have in Antigua or even Guyana hotels etc. If these hotels were to switch [from] the use of fossil fuel to the use of bio-digesters, using the waste to create energy, we can make a big difference in emissions and maybe in the global environment. It is a needle in the sand but at least it creates an avenue for every citizen to play a role and I think we should adopt that kind of approach that all of us as citizens could do something,” Ramsammy added.